In 1981 several members of the Summerville community decided that we could improve the lives of our most vulnerable citizens by offering a meal program delivered each day. It’s been proven over and again that proper nutrition is essential to disease prevention and overall good health. The mission evolved to deliver homebound residents a hot, lunchtime meal. Through the efforts of some dedicated community leaders, clergy and health professionals our first meals were delivered in June 1982. Over 30 years later we have grown to serve over 750 meals per week. We rely exclusively on the community for financial support. We do not receive any government funding and rely on the community to keep us funded. It takes over 175 volunteers each week to keep the wheels rolling. There are 15 routes with anywhere from 10-15 recipients on each route. Every day at 11:15 am the food is available for pick-up and delivery. Teams of two volunteers each transport the hot lunches on their assigned routes. Our food is prepared each day by the very talented Shauntae Snipes, our head cook and her assistant Jill Frey. She consults with nutritionists to ensure the best dietary practices for our recipients. We need volunteers to package the food and prepare it for delivery. 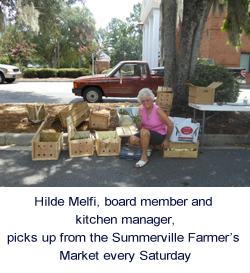 Volunteers help us source the ingredients by picking up from the Low Country Food Bank, the Farmer’s Market and wholesale clubs. Volunteers are the very lifeblood of our organization. The operation is managed by an Executive Director, Crystal Bovell and our Volunteer Coordinator, Lori Carlson. 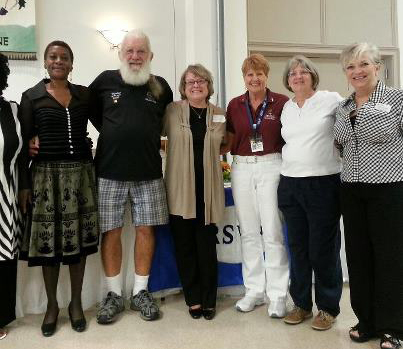 Guidelines and support come from our committed Board of Directors, many of whom are weekly volunteers as well. Our recipients are recommended by local health professionals, churches or concerned friends and neighbors. We visit with the potential “client” and make sure that we will be able to assist them. In most cases, these meals mean that people can remain in their homes and avoid the high cost of residential care centers. We don’t just bring a meal, we take a moment to make sure they are secure in their living arrangement. 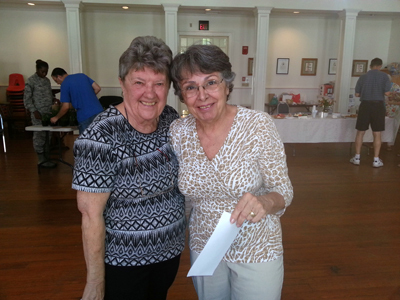 If you know someone who may benefit from a daily hot meal, contact us at the office 843-873-8224. We are located in Ambler Hall on the campus of St. Paul’s Church at 316 West Carolina Ave in the heart of Summerville, SC. Office hours are Monday through Friday from 9:00 am to 2:00 pm.